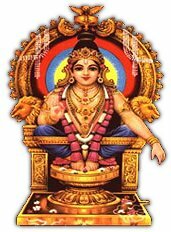 Sabarimala is in the hilly regions east of Kerala bordering Tamilnadu. Situated in the midst of 18 hills, in a bowl of land blessed with a small rivulet named Urakuzhi Theertham. Elevation above mean sea level is approximately 1260 Metres/4135 Ft. Sabarimala is located at 010 degrees/115 Km (direct air distance) from the international airport of Thiruvanathapuram (Trivandrum), and 118 degrees/106 Kms from the international airport at Kochi (Cochin). The most striking aspect about the pilgrimage to Sabarimala is that pilgrims undertake it without caste, creed, position or social status considerations. They go with only one thing "Swami Darshan" on their mind and one mantra "Swami Saranam Ayyappa" on their lips which they chant or shout constantly. 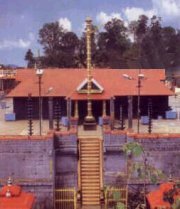 Temples existed in each of the hills surrounding Sabarimala. While many are still intact and functional (at places in surrounding areas like Nilackal, Kalaketi, Inchiparakotta and Karimala) others are in ruins for considerable length of time. Ruins of old temples are visible in the remaining hills.